There are so many choices for wedding band styles it can be overwhelming when ultimately making your final decision. Sometimes simple is best for a ring you’ll be wearing every day for years to come, but by adding a personal element it can make a simple ring uniquely meaningful. I am such a big fan of your sand casting and I loved seeing the stories of the past bands you made, especially those that include sand from memorable places. 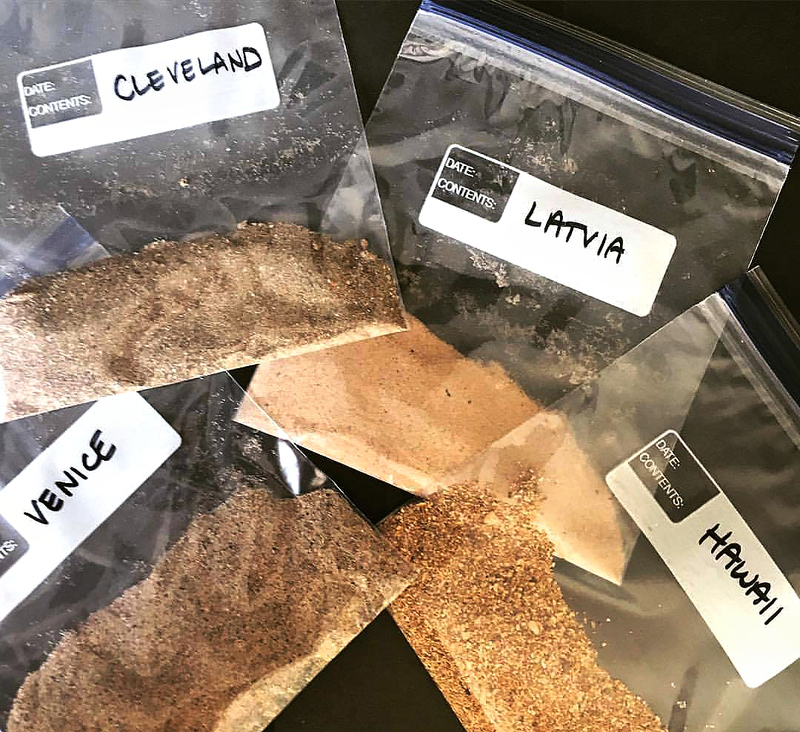 I’ve been collecting sand from Cleveland (my birthplace), Latvia (my heritage), Venice (where we met) and am waiting to get sand from Hawaii (where Troy was born). Later that month a package arrived containing 4 small bags of beach sand each labelled for their location. Beach sand collected by the couple was used in the casting process to create a unique and personalized texture on their wedding bands. As you can see in the photo above each sand has its own unique texture. The Latvian sand is fine and powdery while the Hawaiian is gritty and gravely, each creating a unique and defined texture in the rings. 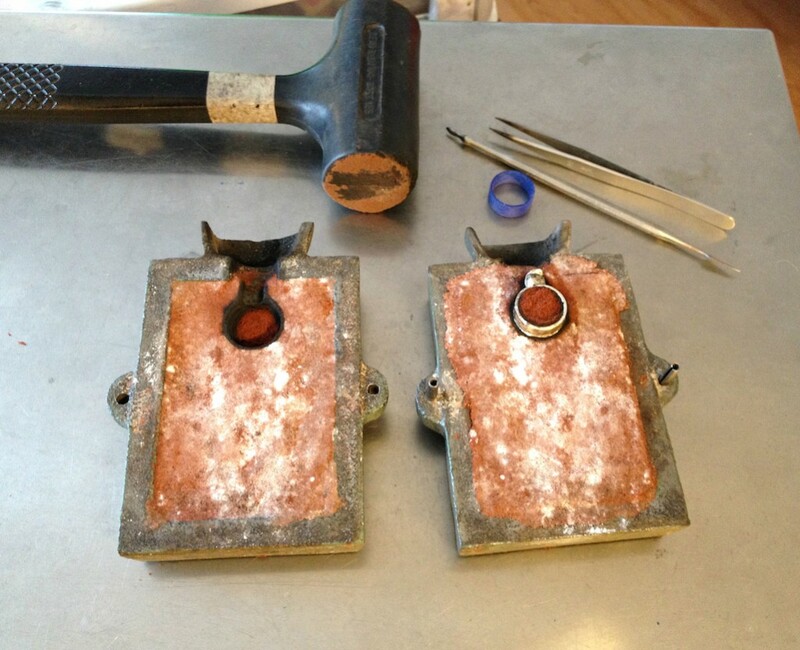 The 4 varieties of sands were blended together then sprinkled onto the surface of my sand casting frames. This sand mixture created the texture on the surface of Inta and Troy’s wedding bands. You can see how the gravely Hawaiian sand randomly created dimples and craters amongst the finer sand texturing. Inta & Troys uniquely personalized and meaningful wedding bands. They’re really incredible. I’m in awe. The sand from Hawaii is from Lanai and it’s from specifically Shipwrecked Beach. Troys dad asked a friend who still lives there to gather some sand- as soon as Troy saw it he recognized the beach 😊. It’s pretty spectacular and I love the combination of that with the Latvian sand, which I had forgotten is so fine. It’s such a beautiful representation of our 2 lives coming together and creating a new journey together. Thank you for making this most beautiful artistic expression of our momentous day! There is an element of surprise involved with every sand cast creation. The textured result is slightly unpredictable, therefore each piece is a unique, one of a kind. It’s all part of the magic, using an ancient technique to create personalized symbols of everlasting love. OMG!!!! JEANETTE!!! They are absolutely beautiful! Beyond what I imagined. I’m teary-eyed! You are magic! Thank you thank you thank you!!! Ancient technique of sand casting. 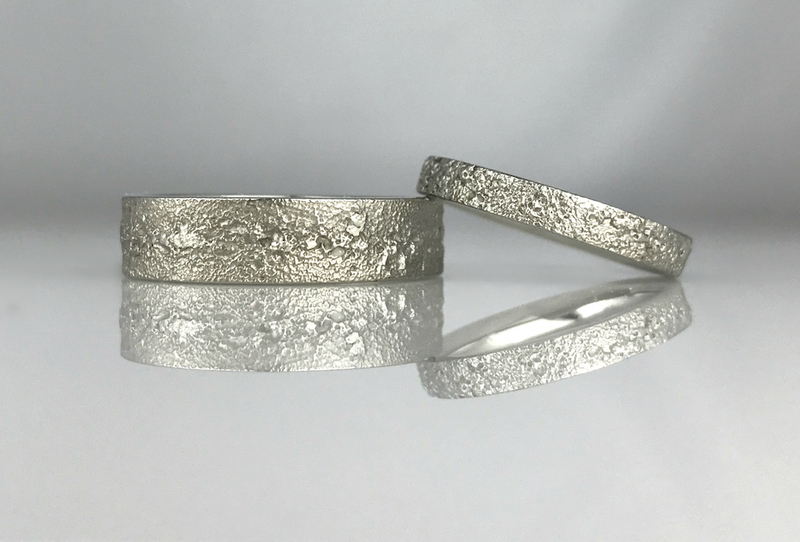 If you are interested in having sand textured wedding bands or any other special piece created click on this link to start the design process. Design consultation with sketches and quotes is free. It was such a pleasure and honour to make these special rings for such a lovely couple. A few years ago I made significant changes in my business in hopes of living a healthier and happier life. I needed help at the time to work out a strategic plan of action. Inta was one of the wonderful and knowledgeable jewellery business coaches at Flourish & Thrive Academy who worked with me to realize my dreams. Meeting Inta was a true blessing!